Add the Flowmaster Outlaw to your car, truck or SUV for maximum power and exhaust tone. We all know that race cars are loud, but being too loud is sure to keep your racer in pit row. One option for controlling excessive volume is to run a set of restrictive mufflers, but this robs your ride of horsepower. With a Flowmaster Outlaw Series exhaust system, this isn’t the case. This tech inspector-friendly kit flows exhaust gasses freely for unimpeded power and reduces race car racket to get your ride back on the track. Running stock tubes on the race track is sure to draw a last place finish, and laughter, as your ride quietly “whooshes” by. That’s why you need Flowmaster Outlaw Series exhaust system with its, “get out of my way” attitude and performance gains to back it up. Unlike the tiny, shriveled stock exhaust under your ride, the Outlaw Series allows monster motors to breathe freely by using burly, mandrel-bent tubing. This unleashes your ride’s true horsepower potential so you can dominate the competition. And, unlike other performance exhaust kits, Flowmaster systems use mufflers that create a “scavenging” effect to squeeze even more horsepower from your ride’s motor. At the heart of each Flowmaster kit is up to 2 mufflers with specially designed chambers & baffles that cancel unwanted sound frequencies. This keeps your racer’s voice within track limits. Even better, these sound-cancelling chambers & baffles create an area of low pressure within the muffler, which draws additional exhaust out of the engine’s cylinders. This allows even more fresh air to flow into the cylinders for extra horsepower. When it comes to powerful pipes, the Flowmaster Outlaw Series exhaust system is sure to give your ride the performance edge it needs and the ultimate Flowmaster sound it deserves. And, depending on noise restrictions in your area, this kit is also suitable for serious street machines. Best of all, the Flowmaster Outlaw Series exhaust system installs easily with basic hand tools, so anyone can enjoy extra horsepower and raw exhaust tone within a few hours. For an idea of what a Flowmaster Outlaw Series exhaust system does for your ride, feel free to check out our Flowmaster Outlaw reviews. I recieved the exhaust system earlier than expected. I put it on the same night and had to go for a test drive. The sound is great, just what I wanted. There is a litte more throttle response also. The factory exhaust came off a little difficult (9 years old), but there were no problems mounting the flowmaster system. I would recommend this system to all. What is the difference between standard 304 and standard 409 grade stainless? I notice there is a $40 difference between them. Can they be polished to bright? Hi Tom, the numbers represent the different components the steel is made up of, and therefore the grade. 409 is a lower grade than the 304, meaning it is more susceptible to corrosion. 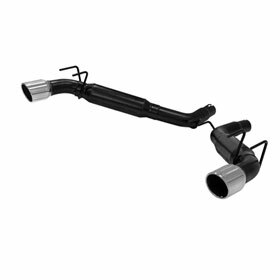 It is commonly held among enthusiasts that 304 is the best for exhaust systems; however, 409 grade is still of much higher quality than aluminized or mild steel. And yes, both grades can be polished. Reference # 758-169-454 © 2000-2019 AutoAnything, Inc.